A Spitfire that crashed in Cambridgeshire while on a training mission during World War Two is to be dug up by archaeologists. The Rhodesian Squadron Royal Air Force plane, based at RAF Wittering, crashed at Holme on 22 November 1940. 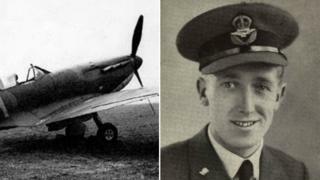 Pilot Officer Harold Penketh, from Brighton, did not bail out and died. The Spitfire remains were found after a geophysical survey of the area. It is hoped the recovered parts will be put on public display. The cause of the crash was never fully established, although witnesses said the Mk 1A Spitfire X4583 broke formation and nose-dived into farmland in the village of Holme, south of Peterborough. An investigation concluded either the pilot's oxygen system failed or there was a physical failure of the plane. Pilot Officer Penketh, 20, made no attempt to use his parachute. His body was recovered from the wreckage and returned to his family. The "enormous crater" created by the Spitfire quickly filled with water as the water table in the area is high, eyewitness John Bliss, who was a child at the time, said. The spitfire remains have lain in their watery grave for 75 years. Lead archaeologist Stephen Macaulay said the fenland peat should have kept the Spitfire "reasonably well-preserved"
The crash site was located after a geophysical survey and metal detecting carried out by Cranfield University in August. The excavation, which started on Monday and is expected to take a week, is being led by Oxford Archaeology East. The remains, which are still the property of the Ministry of Defence, will be cleaned and documented. Some are expected to be put on display later this month. Following the excavation, the land will be restored to a mix of fenland habitats and managed as part of the Great Fen reserve by the Wildlife Trust for Bedfordshire, Cambridgeshire and Northamptonshire. BBC iWonder: Why do we love the Spitfire?